Discover the rich history and flavors of Lyon on this evening electric bike tour. 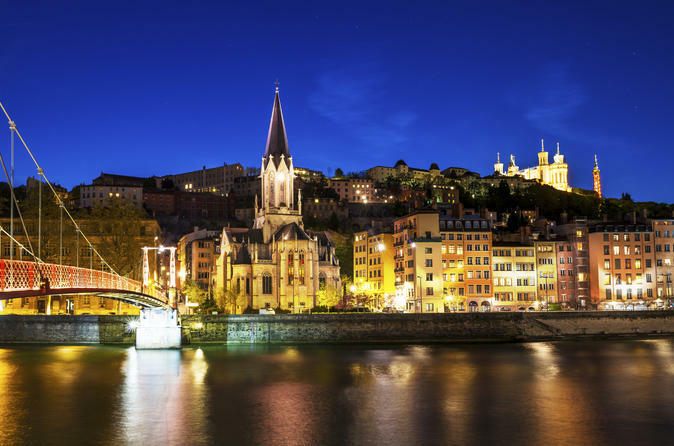 Pedal through the UNESCO-listed streets of Old Town and up to the hillside Basilica of Notre-Dame de Fourvière with ease, and admire the reflection of illuminated monuments in the Rhône River. Settle in at a lively restaurant for a sampling of regional specialties like buttery cheese, cured ham and sweet treats, paired with French wine. Group size is limited to 10 for a more personalized experience. Boasting 2,000 years of history, Lyon is also renowned as France’s culinary capital. Make your way to the centrally located Palais de Justice at dusk, where you’ll meet your local guide and get fitted for an electric bike. Equipped with a battery-powered boost, you’ll cruise through Lyon’s historic streets and up its hillsides with ease. Begin by cycling through the UNESCO World Heritage-listed Old Town, where your guide will share fascinating tales and tidbits from Lyon’s ancient and medieval past. Cruise along the floodlit banks of the Rhône River, admiring the reflection of illuminated waterside monuments. Let your bike’s electric motor help propel you up a hillside to the glowing 19th-century Basilica of Notre-Dame de Fourvière, where you can soak up majestic views of the sparkling city lights and winding river below. Take a break at a local restaurant to get a sense of Lyon’s vibrant nightlife and gastronomic highlights. From platters passed among your small group, sample regional specialties like creamy St-Félicien cheese, rosette pork sausage, cured ham and sweet cake, and toast your night out with a glass of wine. Climb back in the saddle and continue on with a ride through the squares of Place Bellecour and Place des Terraux. Get a nighttime perspective on monuments like Palais St-Pierre, Musée des Beaux-Arts de Lyon and City Hall. After 3 hours, say farewell to your guide back at the Palais de Justice.